Janus vs AFSCME Ruling Imminent – What Will Change? In February 2018, the U.S. Supreme Court heard arguments in Janus vs. AFSCME, a case that challenges the ability of public sector unions to compel public employees to pay agency fees. While public sector employees currently have the ability to opt-out of paying that portion of union dues that are used for political activities, they still have to pay agency fees. This is based on the presumption that all members of a bargaining unit benefit from union negotiations with management, therefore all of them should pay those costs. The Janus case argues that in the public sector, even these negotiations are inherently political and therefore it would be a violation of the right to free speech to compel any employee to help pay for them. The Supreme Court appears likely to agree. In an unrelated case also affecting unions, this week the U.S. Supreme Court just ruled in favor of employers, affirming that “employers have the right to insist that labor disputes get resolved individually, rather than allowing workers to join together in class-action lawsuits.” The majority opinion was written by newly appointed Justice Gorsuch, reinforcing hopes that he will rule for the plaintiffs in the Janus case. But will making agency fees optional result in dramatic change? The potential is there for dramatic change, because as of 2017, 7.2 million government workers belong to a union. Their total membership nearly equals the total membership of private sector unions, 7.6 million, despite federal, state and local government workers only comprising about 17% of the U.S. workforce. In California, state and local government unions are estimated to collect and spend over $1.0 billion every year. Clearly, a ruling for the plaintiffs in the Janus case will cause a reduction in public sector union dues revenue. If public employees are no longer compelled to pay agency fees, some of them will stop paying them. But how many will stop paying? A study released this month by the Illinois Economic Policy Institute (IEPI) – which based on the composition of its board of directors appears to be sympathetic to unions – estimates that 726,000 public sector union members will no longer pay dues, a drop of around 10%. IEPI’s study also estimates that in California, public sector union membership will decline by 189,000, dropping from an estimated 1,235,000 members in 2017 down to 1,046,000 members. But will California’s public sector union membership really drop by 18%, taking nearly $200 million out of their annual collections? The survey also asked non-union members – those members who have opted out of paying the political portion of their dues, but still pay agency fees – “If you could, how likely would you be to opt-out of paying agency fees to a union” there were 36% who were “very likely” to opt-out, and another 25% who were “somewhat likely.” How do these responses translate into lost revenue? According to UnionStats.com, only about 6% of California’s public sector employees who are part of collective bargaining units have opted to become non-members, i.e., only paying the agency fees. Crunching these variables is problematic. Are the e4e national survey results representative of California? Are the responses by teachers in the e4e survey representative of public employees in other sectors? Nonetheless, the e4e survey results do suggest the revenue loss to public sector unions could be greater than the amount predicted by the IEPI study. For example, if you assume that all of California’s public sector members who were “very likely” to opt out of union membership did so, and half of those who were “somewhat likely” to opt out did so, and if you made a similar set of assumptions based on the survey responses of the non-union members who were employed within collective bargaining units, you would see a public sector union membership in California decline by 320,000, a decline of 26%, from an estimated 1,235,000 members to 915,000 members. The biggest unknown is the details of the upcoming Supreme Court ruling. While all indications so far are that the ruling will be in favor of Janus, what remedies will result? A huge variable will be which party will have to take the initiative. That is, will employees have to approach the unions and request to opt-out of membership, or will the unions have to approach the employees and request them to opt-in to membership? Another huge variable will be how often the opportunity to change membership status be offered. No matter whether union membership is based on employees getting to opt-in or having to opt-out, when will they do that? Once per year, within narrowly specified dates, or perpetually at any time? It is likely the ruling will leave many of these details up to the individual states to decide. Public sector employees face a difficult choice. They can accept union representation, knowing that in most cases this results in their receiving over-market pay and benefits, or they can reject union representation, knowing that the agenda of public sector unions is almost always in opposition to the public interest. That’s not easy. What must be easy, however, is for public employees to have access to whatever information is needed to withdraw from public sector union membership. This way, those who wish to stay true to the ideals of public service can put the interests of the public in front of their personal interests, by knowing how to jump through through whatever bureaucratic hoops the unions and the state legislature may put in their way. This case constitutes a new challenge for those who oppose public sector unions. Making sure that to whatever extent the Janus ruling liberates public sector employees from the grip of public sector unions, those public employees will know how to realize their freedom, quitting those unions, putting the citizens they serve in front of themselves. The Janus decision is expected by June 30th, if not sooner. Edward Ring co-founded the California Policy Center in 2010 and served as its president through 2016. The Friedrichs lawsuit should have done the trick. The case — full name: Friedrichsv. California Teacher’s Association — which would have made belonging to a public-employee union optional as a condition of employment nationwide, was set to pass muster with the Supreme Court last year. But when Justice Antonin Scalia died in February 2016, the almost certain fifth and deciding vote went with him, thus keeping half the country’s government workers forcibly yoked to unions. 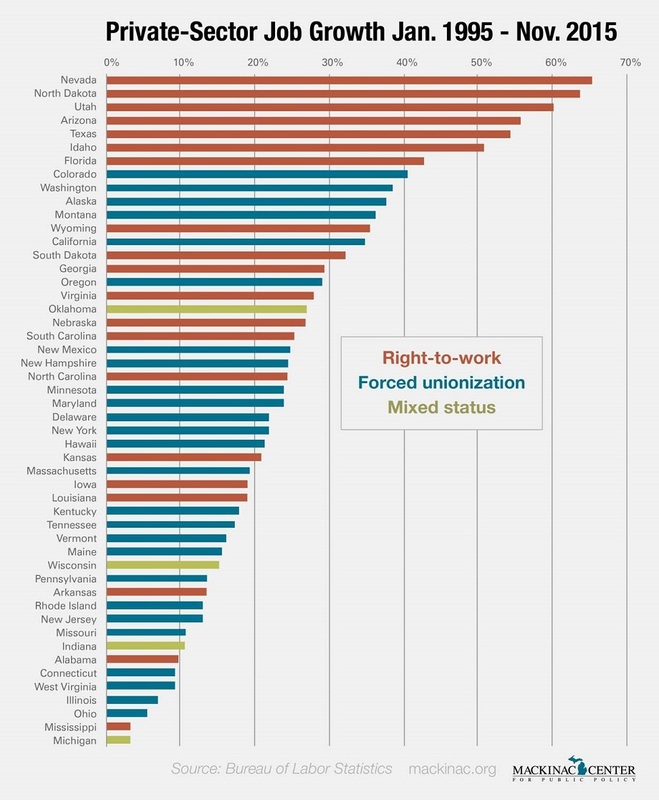 It’s worth noting that in Wisconsin and Michigan, two recent entries in the right-to-work column, teachers’ union participation is down considerably. Wisconsin’s NEA affiliate has lost almost 60 percent of its members and Michigan about 20 percent thus far. The loss of these unions’ political clout certainly was a factor in giving Donald Trump narrow victories in both states. Should the Court decide for Janus in Janus, neither the apocalypse nor utopia will be upon us, but much will change. Most notably, many government workers will have much freedom than they have now, and the Democratic Party won’t have the same bundles of cash flowing from union piggy banks. As the March 20 start of confirmation hearings for Neil Gorsuch approaches, Americans have been hearing about litmus tests. For instance, Sen. Charles Schumer, D-N.Y., and Rep. Nancy Pelosi, D-Calif., have set up a standard of “being mainstream” in their eyes and respecting precedents they like, ignoring whether they violate the Constitution. However, there is a far more relevant litmus test – our founders’ views of American government under the Constitution justices pledge to defend. They are worth reviewing as a primer for where attention should focus on any nominee for the Supreme Court. Samuel Adams: The liberties of our country, the freedom of our civil constitution … it is our duty to defend them against all attacks … to maintain the rights bequeathed to us. Patrick Henry: Liberty ought to be the direct end of your government. Thomas Paine: A constitution is not the act of a government but of a people constituting a government … . All delegated power is a trust, and all assumed power is usurpation. James Wilson: Government … should be formed to secure and enlarge the exercise of the natural rights of its members; and every government which has not this in view as its principal object is not a government of the legitimate kind. Benjamin Franklin: An equal dispensation of protection, rights, privileges and advantages, is what every part is entitled to. Thomas Jefferson: A sound spirit of legislation … banishing all arbitrary and unnecessary restraint on individual action, shall leave us free to do whatever does not violate the equal rights of another. John Dickinson: We cannot be free, without being secure in our property … we cannot be secure in our property, if, without our consent, others may, as by right, take it away. George Washington: [Government] has no more right to put their hands into my pockets, without my consent, than I have to put my hands into yours. John Adams: The moment the idea is admitted into society that property is not as sacred as the laws of God, and that there is not a force of law and public justice to protect it, anarchy and tyranny commence. …“Thou shalt not covet” and “Thou shalt not steal” … must be made inviolable precepts in every society before it can be … made free. Richard Henry Lee: It must never be forgotten … that the liberties of the people are not so safe under the gracious manner of government as by the limitation of power. James Madison: The powers of the federal government are enumerated … it has legislative powers on defined and limited objects, beyond which it cannot extend its jurisdiction. John Taylor of Caroline: Every innovation which weakens the limitations and divisions of power … makes [government] strong for the object of oppression. Alexander Hamilton: A limited Constitution … can be preserved in practice no other way than through the medium of courts of justice, whose duty it must be to declare all acts contrary to the manifest tenor of the Constitution void. Without this, all the reservations of particular rights or privileges would amount to nothing. … To deny this would be to affirm … that men acting by virtue of powers may do not only what their powers do not authorize, but what they forbid. Joseph Story: The Constitution of the United States is to receive a reasonable interpretation of its language and its powers, keeping in view the objects and purposes for which those powers were conferred. James Otis: An act against the Constitution is void. George Mason: Flagrant violations of the Constitution must disgust the best and wisest part of the community. Mercy Otis Warren: Any attempt [to] subvert the Constitution … cannot be too severely censured. Our founders clearly revealed their central purpose was defending Americans’ rights and liberties against encroachment, particularly from overbearing government. That is the Supreme Court’s primary function. Therefore that should the central litmus test focus in evaluating Judge Gorsuch, as well as any other nominee, to the court tasked with preserving and protecting the highest law of the land. Gary M. Galles is a Professor of Economics at Pepperdine University, a Research Fellow at the Independent Institute, an Adjunct Scholar at the Ludwig von Mises Institute and a member of the Foundation for Economic Education Faculty Network. His books include “Lines of Liberty” (2016), “Faulty Premises, Faulty Policies” (2014) and “Apostle of Peace” (2013).